We all know that it is important to know where our food comes from, right? 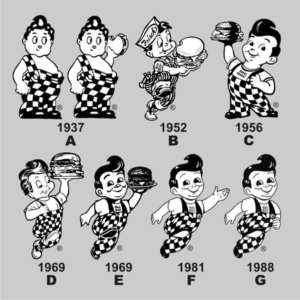 Luckily, there is a cheat sheet in case you forgot. A cheat sheet in the form of an everyday kitchen helper that is. 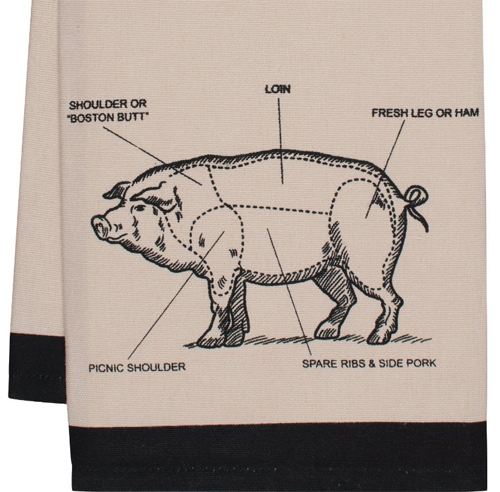 The Gourmet Classics Chef’s Cut Chart Pig Kitchen Towel is a good-sized, 20-inch by 30-inch cotton towel printed with an image of what food comes from where on a pig. Perfect for cleaning up slop masterful kitchen creations. Cows are pretty recognizable creatures. They are big, slow and make milk. Another thing they got going on are spots. Lots and lots of spots. 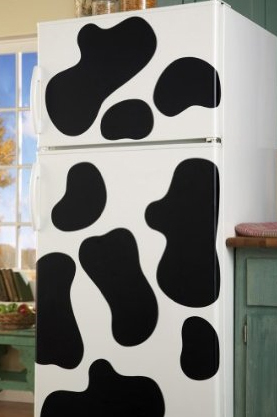 If one decides to decorate a kitchen with these Vinyl Farmyard Cow Spot Removable Wall Decal Stickers by Winston Brands nobody would ask what they were. Why perhaps, but certainly not what. Moo! Oh, those wacky chicken-hawking cows. They want you to “Eat Mor Chikin”, and they are willing to pay for it. 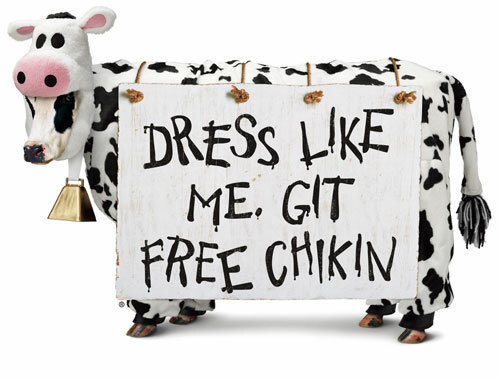 Dress up like a cow and on July 8th, you can get free chicken (or chikin) at Chick-fil-A. Dress up like a cow on July 9th and you’ll have to pay for it. But then again, you’ll be dressed up like a cow, which may or may not have happened anyway.